Ryder Air Rifle Just $22! Down From $65! 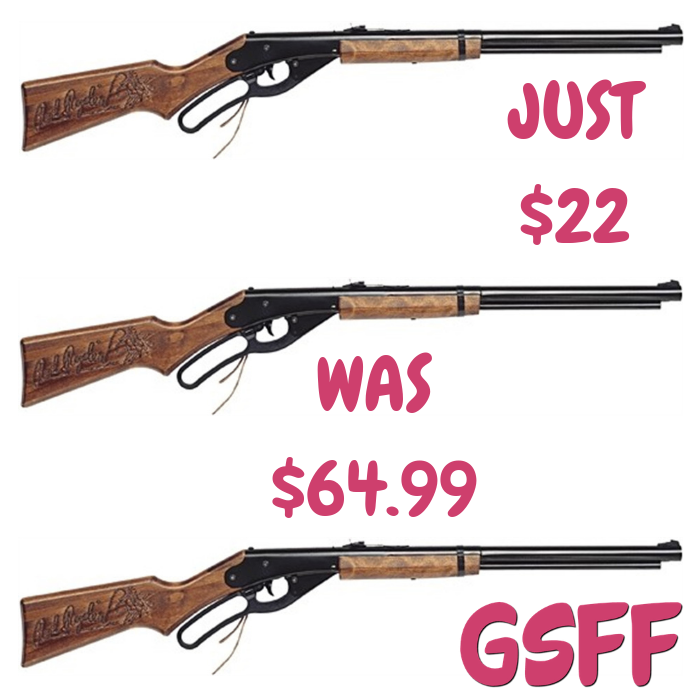 Head over to Walmart to score this Red Ryder Air Rifle for just $22 down from $64.99 PLUS FREE store pick up or FREE shipping (selected states) for orders $35 or more! Hit your target with the Daisy Youth Air Rifle Red Ryder 1938. The dependable design and tradition of the Red Ryder make this piece America’s favorite. It is safe for kids to use with adult supervision. With a solid wood stock and classic styling, this Daisy BB gun is ideal for beginners and hobbyists. It carries a rich tradition and a dependable design common with the brand. It is crafted with a stained solid wood stock with a lariat logo, a burnished forearm band and a smooth bore steel barrel. The lever-cocking spring air action propels the BBs at a maximum velocity of 350 feet per second. The Red Ryder gun has the ability to shoot up to 195 yards, which is sure to impress those with old childhood memories and a new generation of enthusiasts. This firearm has a 650-shot capacity that ensures a lengthy stay at the shooting range for you and your sharp shooter. This is an ideal way to teach your son or daughter hunting and gun safety skills. The Daisy Youth Air Rifle Red Ryder 1938 is available in three wood finishes.